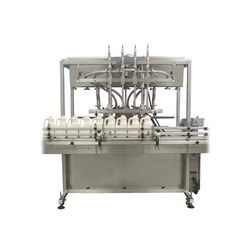 Leading Manufacturer of liquid filling machine from Noida. With our rich industry experience, we manufacture and supply an extensive range of Liquid Filling Machine. Our offered filling machine is designed using quality tested components and sophisticated technology in line with industry norms. Apart from this, provided filling machine is available in diversified sizes and designs as per the needs of the clients. We offer this filling machine to our customers at nominal prices.